50km completed with only 1 (ONE) checkpoint at Bukit Shahbandar Recreational Park. It was a very tiring expedition but a good one. Left pictures, the back end of the group. 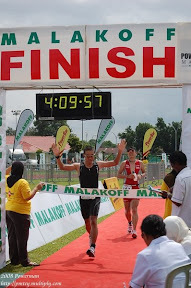 Right pictures, the front pack with Pehin Yahya and 2 Marshals leading the ride.